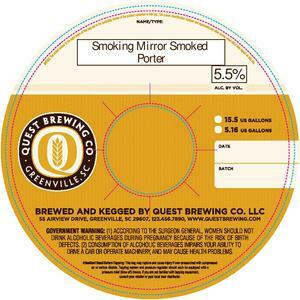 Smoking Mirror is brewed by Quest Brewing Company in Greenville, South Carolina. The alcohol content is 5.5%. This brew is served on tap. We first spotted this label on May 19, 2013. The best business secrets wikileaked from the private records of the most successful craft breweries in the United States. Enlighten yourself, but please don't correct others. It's just one of those Catch-69 situations, like when somebody has ketchup on their face. What's your beer IQ? This test measures an individual’s beer knowledge through a series of questions of varying levels of difficulty: Normal, Hard, and Insane. So you wanna up your bottling game, huh? Well, you've come to the right place. Admit it: No matter if in a DeLorean, TARDIS, or a hot tub, we’ve all thought about what advice we might give our younger selves if we could go back in time. Shining up your keg will probably not improve the taste of your beer, but it looks cool and inspires epic brewing sessions! Decided to take a huge step in improving your homebrew and set up a temperature controlled fermentation system, have ya? Smart thinking. Convert that old keg into a brewing kettle. The advantages of using a keg for homebrewing pretty much come down to quality and cost.